What’s new? 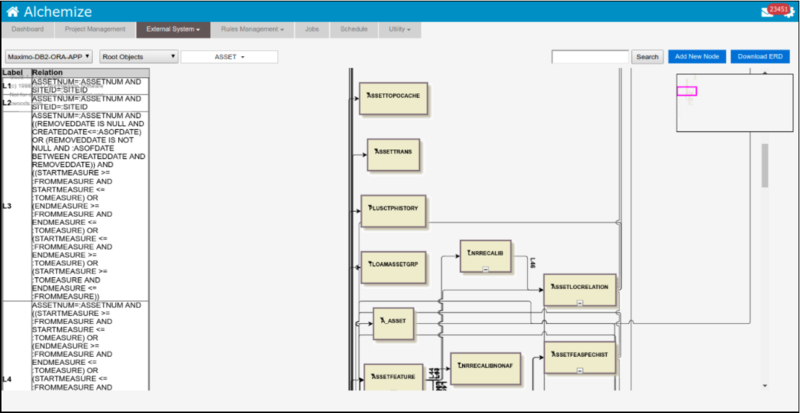 Maxis infuses Alchemize with Entity Relationship Diagram capabilities in version release 4.1.1. We have added new features in this release to find the relationship structure between different objects. This release is mostly focused on the finding and representation of the relationship in the objects or tables in the system. Also with these features, to select and update the transformation script of more than one transformation entries at the same. To remove any particular record permanently from the Alchemize application, a new feature is added to application that is permanent delete. An entity relationship diagram (ERD) shows the relationships of objects stored in a database. This is completely new feature added in the Alchemize in this release. In a particular repository, to view or check its object relation structure for all the objects a new feature is introduced in this release of Alchemize. Using maximo adapter, we can get the relationships between the object. Using application we can assign different adapter to the repository. With the help of this new functionality, it is very easy to identify relations and linking between the different objects in the repository. Each object is represented as the node and relation between these nodes as links. Using the ERD, user can also change and update the relationship between 2 different objects. If user wanted to add a new link between any particular objects, with the help of this features with just drag and drop in between the attributes of the object a new link will get added in the existing relations. Relationship Analyser, this is the newly added functionality in Alchemize for this release. Relationship analyzer can adopt and identify the relationship between the objects of any given RDBMS system even if we don’t have any idea about the business knowledge of that system. Using relationship analyzer, we can easily differentiate root object and non-root object. As a result of this analyser a adapter will be generated for that given system which is having the parent-child relationship. Using this adapter we can generate ER Diagram, Rule set and Jobs for that particular system. In Transformation workspace, to update multiple scripts at the same time a new functionality is implemented in this release of Alchemize. Using this functionality, if same script needed to assign to more than one transformation mapping user can update the transformation script of more than one transformation mapping or entries at the same time. In previous release of Alchemize this functionality was not available because of which user needed to update single transformation mapping individually even if same script needed to assign to more than one transformation mapping. In previous releases of Alchemize delete functionality was available but it was only a soft delete, we can easily restore whatever we have deleted. In this release a new functionality is added that is permanent delete using this functionality we can permanently delete any record from the application. Once record is deleted user can permanently delete that record from the application. If the record is deleted permanently there is no way to restore that record in the application. This functionality is added in the Application, Adapter, Repository, Rule set, Rule, Jobs and Groups features of the Alchemize. Cynthia is our Director of Strategic Alliances. With a marketing background and a veracious appetite for all things data, she is the perfect addition to the team. So You Think Your Maximo Archived Data is Not Accessible? Don’t Fret, Maxis Has a Solution.